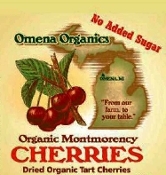 10 # Bulk Case - Omena Organics organic Montmorency tart cherries are pitted, individually quick frozen, infused with Omena Organics organic apple juice concentrate, then slowly dried before lightly misting with organic sunflower oil to prevent clumping. No sulfites added. A good source of potassium, low in sodium and fat free.